This weekend is Doctor Who Comics Day, and we’re having a day of passive programming to celebrate. We’ll have Doctor Who Guess Who (A modified version the teen librarian made) as well as some crafty stuff set out all day. We’ve done a Doctor Who themed party for the 50th Anniversary in November 2013 and teens loved it, so I anticipate this will be a hit, too. This is the accompanying booklist I made in Bibliocommons, and the graphic below lives in our readers’ advisory booklist binder. I’ve divided it by various themes that crop up in Doctor Who. There’s also this cool list made by the Denver Public Library for Denver Comic Con that includes book recommendations by Doctor. There’s some titles that also made my list, but also more suggestions on this list at Teen Librarian Toolbox and a follow up list. 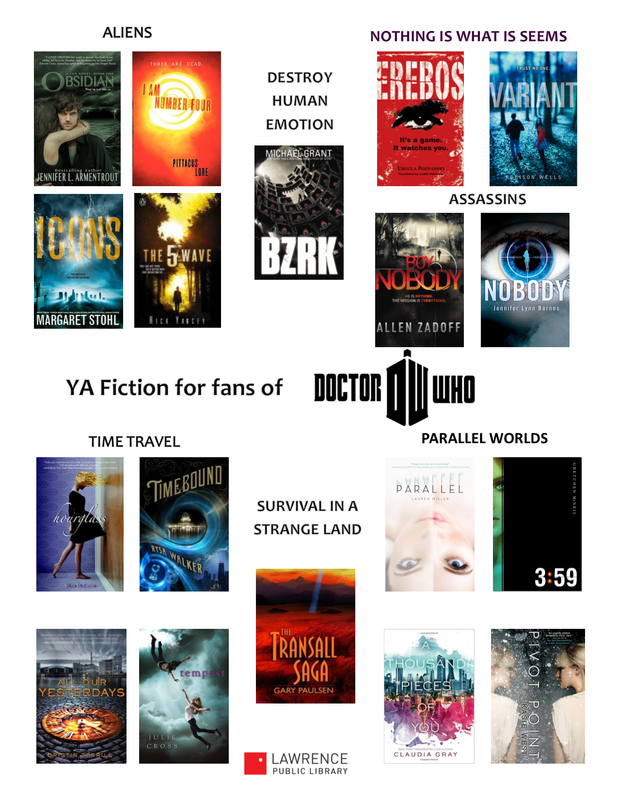 What books would you suggest for fans of Doctor Who? I haven’t read any of these but A Thousand Pieces of You looks so good! Do you have any specific recommendations? Of the ones on this list, I really enjoyed All Our Yesterdays, The Fifth Wave, and I did listen to the audiobook of A Thousand Pieces of You and thought it was well done.